WELCOME to the personal home page/blog of Matthew La France. Please enjoy your stay. 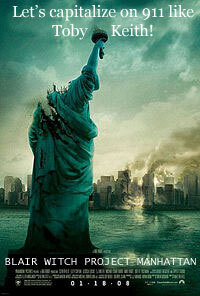 I saw Cloverfield finally. My biggest complement to it is also my biggest complaint. It did a pretty good job of making it seem "real". The whole movie was from the perspective of a camcorder in the hands of a normal if somewhat bumbling man. This has been done before in the Blair Witch Project, if you want to think "Blair Witch Project in Manhattan with huge monster" your pretty much on the right track. The "characters" are established during a party scene after which the previews make clear that something bad happens. The whole camcorder thing basically does what it's supposed to. These characters feel very normal. The scenes of drama that manage to get captured by this non-filmmaker are sometimes quite powerful because of it. There are even bits of previously recorded footage that pop up when the tape has advanced without being recorded on, that add (a very little) to the story. I think that the "reality" angle ultimately brings the movie down unfortunately. Because of the non-filmmaker feeling to the movie, it sometimes feels contrived when trying to do normal filmmaking things like, I don't know, show stuff. This guy either has to have the dedication of a documentary filmmaker or has to be filming the floor most of the time because he's running away. It can't be both ways. As it is, we get a fair amount of shots of things we need to, with the obligatory bunch of wall when appropriate. Unfortunately it fails to retain the suspension of disbelief and we feel like we're watching a low budget (albeit big budget) "movie" made on a camcorder. The movie is basically a love story, but by throwing all the conventions out the window, we really don't begin to care about these characters enough for that to hold the movie, at best it's a drifting point of emotion that seeks closure, which it receives and then leaves us wondering why we are still watching the movie. It's almost like the final moments of the movie are strictly exposition to get us to the point at the beginning of the movie that declares "blah, blah, dehumanizing military sounding code crap, camcorder we found in central park, go". I liked this better than the Host, it at least tried to be a monster movie a little bit, but like that other film, tried too hard to break the mold and be something different, to the point where it was not really good at what it was trying to do. Worth watching for the sense of panic and immediacy, and the bits of drama and monster movie-ness that get through. Worth the praise it's getting or the money it's made, definitely not. And no amount of clever hidden messages or meanings* elevate it to anything beyond passable, these sort of gimmicks are not suitable replacements for a good story. In honor of Valentine's day yesterday I have a picture of Sawai Miyuu. Yay! I just found out she is a Scorpio which is totally hot. I just woke up an am rocking out to Yello again, ohhhhh yeah. My car broke down yesterday. :( It looks like it's going to be fairly simple to fix and I have a car I can use in the mean time so I'm not too upset about it. The worst thing was it made me waste a lot of time. If you like Dead Rising you should check out the t-shirts I made on cafe press. I'm trying to decide what to do with them, or really how to promote them. I think there has to be a way I can sell some, but I need to do some brainstorming. I'm considering coming up with some other designs based on different games and promoting them via a website with a URL that will help me come up in keyword searches, but I'd really like to break away from that keyword/seo based mentality. Maybe I'll try some internet advertising. I've started to realize that if you want to be successful with a business venture of any type there is some risk involved. You have to be willing to spend some money and risk losing it to be successful. It's just a matter of scale, how much you risk and how risky it is. This is pretty much what my life has been like recently. 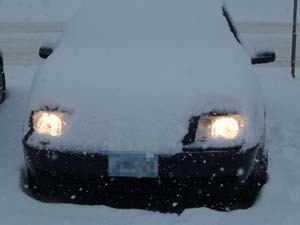 :P I'm starting to get sick of clearing snow off my car, off other people's cars, off decks, off my shoes, out of my hair, etc... But I guess that's what the middle of February is all about. Our current snow depth is in the 25-30 inch range. My page is still in transition, in fact much of it is broken, but I think it will be worth it when I get it all done. I'm just taking my time with it, I don't need to rush, there's no hurry. Some very good news on WtPC. I was given another wip build of the game with over half of the script blocks inserted. Unfortunately the game seems to freeze around day 8. Hopefully that won't be a major setback. On the subject, I was also thinking about character's personal motivations and I realized that the reason I like Sasuke better than Naruto in said series is that Sasuke is pursuing his own justice, vengeance in fact (there it is again). For some reason I'm drawn to Sasuke's struggle much more than Naruto's. I'm sure it's obvious but I've redesigned my site. I've been wanting to do this for a little while but I haven't felt like I had the time nor motivation until now. Things are still a little messy (ha), the style sheet change has effected the sub pages, and not all navigation is working, but it's looking right and behaving properly which is the important part for now. I may be adjusting the content a little or adding features in the near future. I'd like to expand my repertoire of xhtml/css techniques a bit. I started listening to a band called New Skin (more info). I ran across a remix song on a compilation a friend of mine has and decided to investigate them further. They have since become my first mp3 album purchase from Amazon.com. You can check them out on YouTube here.